Memorial day weekend is a very special time of year for fun, parties and barbecues; however, there are many potential dangers to be aware of for our pets, as well as preventative health care tips that animal guardians may take to keep holiday celebrations safe. One of the first things to be aware of this time of year is that sometimes temperatures may be quite warm, especially if barbecues take place in the middle of the day. To avoid risks of heat stroke and hyperthermia in our pets, it is important to provide shade and plenty of water for our pets. Providing ice cubes in the water can keep water cold, as well as possibly an umbrella nearby for hot pets to go for shade if needed. Of course never leave pets unattended in cars for any length of time. These preventative measures are especially important in brachycephalic breeds like boxers and bulldogs, who are very prone to overheating this time of year. Probably one of the most important tips for keeping pets healthy at the barbecues is to avoid giving them barbecued food items, especially fatty, greasy, and spicy items. 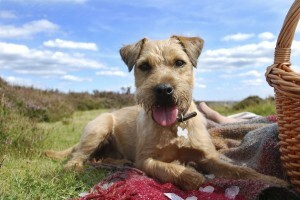 Many dogs, especially toy breeds like poodles and Yorkshire terriers are very sensitive to changes in diets, and giving them table scraps or other barbecue food items may lead to digestive upset, including vomiting, diarrhea and even health-threatening pancreatitis, which may be a medical emergency. If possible, feed the dogs before the scheduled barbecue time, so that they will be less likely to beg for food from holiday guests. It is also important to keep barbecue skewers out of reach, as many dogs will try and chew and ingest these items, leading to potential stomach/intestinal foreign bodies. Finally, it is critical to keep pets away from garbage and trash bags full of cooked bones and other barbecue items. The ingestion of cooked bones may fragment or break, leading to potential intestinal obstruction and/or infection/peritonitis. By following these health care tips, animal guardians can go a long way toward having safe and fun barbecue party.